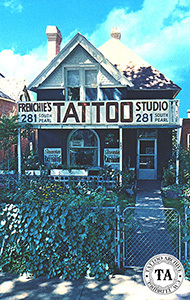 Better known in the tattoo world as "Frenchie" William Neely tattooed for many years in Denver, Colorado. He operated shops in at least three different locations in that city at #637 West 14th Avenue, #1720 Curtis Street and #281 South Pearl Street. Records show that Neely was also located in Balitmore, Maryland at #608 and #722 East Baltimore. Other than business cards and a few photographs that have survived, little of Frenchie's history is known to the Archive. His cards state the usual proof of being 18 years old, sobriety required, 5000 designs, sanitary studio, bright colors, reasonable prices and old work covered or re-colored. However, there were some things that were a bit different, like the latest electronic equipment and ultra-violet sterilization. Frenchie offered one of the few customer appreciation cards we have ever seen for a tattoo shop. When a customer got tattooed the cost of the tattoo was punched into the card. When the card was full of punches it was good for a free tattoo. 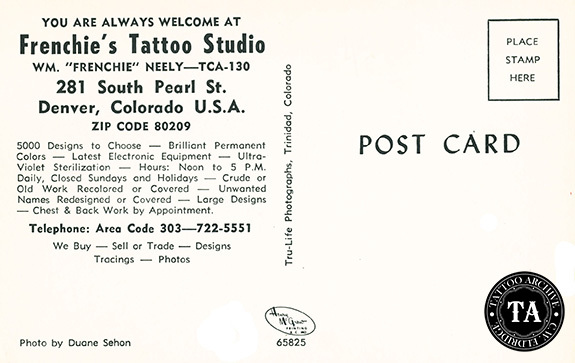 Seen with this article is the front and back of a promotional postcard from Neely's #281 South Pearl Street location in Denver, circa 1960s.